Kitchen ceiling fans are a must-have for those who live in warmer climates or simple need the extra air circulation. With so many options it can get overwhelming picking the best ceiling fan for your kitchen style. That’s why we have made a list of the best ceiling fans for kitchens that you can buy right now. These ceiling fans are not only functional, but they look great with just about any kitchen decor. From sleek and modern ceiling fans that match your appliances, to contemporary caged ceiling fans that double as attractive pendent lighting there are countless ceiling fan styles to choose from. By choosing kitchen ceiling fans with light you can double the functionality of a fan by also using it as your light source. Here are our top picks for the best ceiling fans for kitchens. Casablanca offers one of the best ceiling fans for kitchens with their 44-inch Wisp model. This ceiling fan is packed with features that work really well in a kitchen setting such as a 16 degree blade pitch for a powerful breeze, a silent Direct Drive motor, and a stylish design that goes with just about any kitchen decor. Those looking for a kitchen ceiling fans with light will gladly note that the Casablanca Wisp comes with an integrated LED light kit to brighten up any space. A reversible motor means year round use as you can set the fan to spin in downdraft mode for a cooling breeze in the summer and updraft mode for warm air circulation during colder months. It’s modern design and quiet motor earned the Casablanca Wisp a mention on our list of best ceiling fans for small bedrooms but it’s exactly these features that make the Wisp so perfect for small to medium sized kitchens. Fresh white fan color goes great with appliances and most kitchen decor. Harbor Breeze offers the best ceiling fan for kitchens with low ceilings with their Mazon flush mount model. At 44-inches, the Harbor Breeze Mazon works best with small to medium size kitchens that need powerful air movement in a compact design. We love this kitchen ceiling fan for it’s modern design that goes with just about any decor. A brushed nickel body and matching fan blades means the Mazon will go perfectly with stainless steel appliances. The included remote control means no dangling pull-chain that can ruin the fan’s modern and sleek look. The Emerson Tilo has made our list of best ceiling fans for kitchens thanks to it’s easy to use wall controls, powerful four-speed motor and compact design. At only 30-inches, the Emerson Tilo is perfect for smaller kitchens or dining areas. The fan is available in white, brushed steel and bronze to match common kitchen appliances, cabinets and floors. Emerson thoughtfully allows for the Tilo to be mounted as either a standard ceiling fan or as a hugger fan for low ceilings. For those with kitchens with ceilings higher than 9-feet, Emerson offers longer downrods that can be purchased separately. It’s this kind of versatility in design that makes the Emerson Tilo one the best kitchen ceiling fans on the market today. The Fanimation Studio Vintere ceiling fan is proof that you don’t have to choose between a stylish light fixture and a kitchen ceiling fan. This best of both worlds design combines a stylish 4-light chandelier with a functional ceiling fan. The Vintere ceiling fan includes vintage-style candelabra bulbs inside a unique industrial style caged drum for a unique look. At 23-inches, this ceiling fan is perfect for smaller kitchen or dining areas. And for those with larger kitchen spaces, you can place multiple fans to act as pendant lighting over kitchen islands and dining counters. One feature we really like about the Fanimation Studio Vintere ceiling fan is the remote control capabilities. Not only can you control the ceiling fan speed but the remote control also allows you to set the fan on a 1, 3 or 6 hour timer. The bulbs are also dimmable and can be controlled by the remote control to set just the right mood. Hunter offers a contemporary kitchen ceiling fan option with their Builder Deluxe model. This 52-inch ceiling fan is perfect for larger kitchens that need a reliable ceiling fan that can be used year-round. Hunter’s Builder ceiling fan models are known for their great value, polished designs and powerful air movement. Thanks to it’s WhisperWind motor, the Hunter Builder Deluxe is also incredibly quiet even on it’s highest setting. It’s reversible Brazilian Cherry and Stained Oak blades means the ability to match kitchen cabinets and floors for a sleek and stylish look. Very few brands make as elegant and posh home lighting as Rossini Euro Design. Their Segue ceiling fan is their take on stylish ceiling lighting that mixes what we love about pendent lights with the functionality of a ceiling fan. At 16-inches the fan is great for small kitchens, dining counters or above kitchen islands. It’s brushed nickel finish means it’s easy to match to modern stainless steel appliances for a seamless look. Not only does the Segue feature 5 bright downlights, it also features a fan that swivels so that you can direct airflow where you need it most. Choosing the best ceiling fan for your kitchen is as easy as following our simple guide. 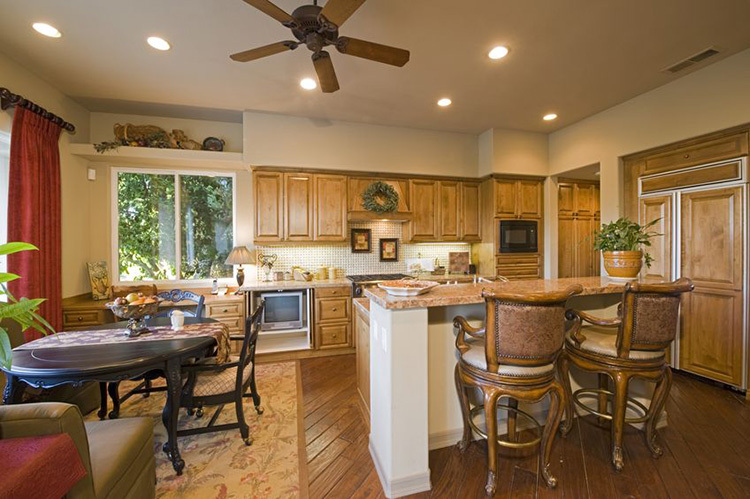 1) What size ceiling fan does your kitchen need? The first step in choosing a kitchen ceiling fan is determining the correct fan size needed for your space. This step is as easy as finding your kitchen’s square footage to determine your ceiling fan’s appropriate blade sweep size. For a step-by-step guide on how to do this make sure to check out our How to Choose the Right Ceiling Fan Size guide. Kitchens can sometimes differ from other rooms in your home thanks to the popularity of open floor plans. If your kitchen does not have four walls or is positioned inside a larger room what you will need to do is measure the length and width of the perimeter of the kitchen itself. This will help determine the end of the ceiling fan’s reach. Another thing to consider when determining a kitchen’s ceiling fan size is whether you need the entire kitchen to receive air circulation or only a portion of the kitchen. For example, you may only want a cooling breeze where there is seating in a breakfast nook or above a dining counter. In this case, you will want to go with a smaller ceiling fan hung directly above these spaces instead of a large fan that covers the entire kitchen. Measuring these spaces is the same except that you will measure the perimeter of the space itself instead the entire kitchen. One thing you’ll notice when shopping for ceiling fans for kitchens is that the size of the fan will usually be smaller than ceiling fans purchased for living rooms or large master bedrooms. This is due to the fact that kitchens tend to run smaller and don’t need to cover as much square footage. In these cases a 44-inch or 30-inch ceiling fan may be more than enough to cool down a kitchen. For larger kitchens however, going with a full size 52-inch ceiling fan will be your best bet. Example of kitchen ceiling fan without light. 2) Does Your Ceiling Fan NEED to Provide lighting? Once you have determined the size of your kitchen ceiling fan the next step is to determine whether or not your ceiling fan should include a light kit.Kitchen ceiling fans with light are best for small kitchens who don’t have a lot of room for overhead lighting. Ceiling fan lights can also can provide great mood lighting over dining areas and kitchen islands. However, not all kitchen ceiling fans need to double as overhead lighting. This is especially true for large kitchens or kitchens with very tall ceilings. In these cases a ceiling fan can be used just for air circulation while ceiling lights or decorative lighting can provide be used to light up the space. The best ceiling fans for kitchens not only provide much-needed airflow but match the style and decor of the kitchen. With so many ceiling fan styles available today it’s easier than ever to integrate a ceiling fan into your kitchen’s decor. 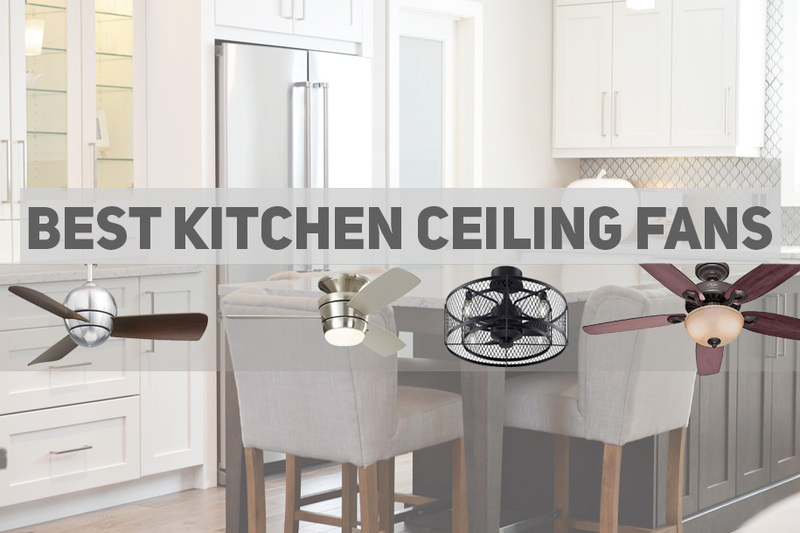 Here are some kitchen ceiling fan ideas for you to consider before picking out your next kitchen ceiling fan. White ceiling fans can make a small kitchen look more spacious. Going with a white kitchen ceiling fan and matching white painted ceiling is an easy way to open up a small kitchen and give it the appearance of a larger space. This is because white ceilings allow small rooms to appear larger and short ceilings to appear taller. If you have a small kitchen consider going with a simple white ceiling fan that can help open up the space. Match ceiling fan colors to your kitchen decor. A big objection to ceiling fans in kitchens is that it ruins the overall look of the kitchen by clashing with existing decor. However, with so many ceiling fan styles to choose from nothing can be further from the truth. Wood grain ceiling fan blades can match wood cabinets, floors and kitchen furniture to create a cohesive look. Alternatively white, black and stainless steel ceiling fans can match kitchen appliances and other decor items in the same way. By matching colors and wood grains, you can use your kitchen ceiling fan as part of your decor instead of an afterthought. You don’t have to choose between a kitchen ceiling fan and decorative lighting. If you think you have to choose between decorative pendant lights and a ceiling fan for your kitchen then think again. Brands like Fanimation and Possini offer fan designs that look like pendent lighting so you can have the best of both worlds. In fact, there are also ceiling fan chandelier combos that look great over dining areas while still providing much-needed airflow. For more unique kitchen ceiling fan ideas make sure to check our list of favorite cage enclosed ceiling fans and chandelier ceiling fans.